It's Hallowe'en, so this week's visit to the archive had to exhume a local ghost story! Who wouldn't love a beer-supping spectre? The report is stated as follows: - The watchman, who attends near the spot we have mentioned, declares, that being perfectly sober, and in full possession of his senses, he saw a certain Gentleman, who had recently been buried, rise from his tomb, and heard him, with the good humoured tone for which he was distinguished, call for a pot of beer, and invite the watchman to share it with him. The watchman, however, was too much alarmed to accept the kind invitation; but mentioning the circumstances the next day, he prevailed on two other watchmen to keep him company the following night, and await the return of the apparition, which wonderful to relate, they all three saw and heard the same person call for and solicit a pot of his favourite beverage. These facts, it is added, have been solemnly stated before Mr. Dornford, the Magistrate, and have created no small bustle and apprehension throughout the neighbourhood. This convivial ghost may not have been seen for some time, but he gives us the perfect opportunity to raise a beer in tribute. Happy halloween! With hallowe'en nearly upon us, here are some suggestions for eerie enjoyment. 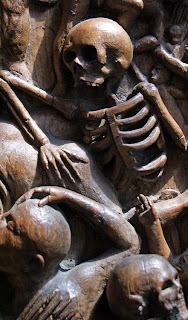 New blog Therein Hangs a Tale makes a suitably seasonal beginning, investigating the Victorian fear of premature burial. Think Poe, muffled moans and beheadings! By contrast, The Great Wen gives us London's crappest ghost. Think frozen food! Not all the season's horrors are spectral. Some are made of cake and icing. Finally, why not spread the fear with a fabulous Victorian hallowe'en e-card? Image: Victorian e-card from Halloween is Here! We hear that a Waterman at Deptford has been taken up for bringing too that Place a Bale of Goods belonging to the two Turkey Ships lately burnt on the Flatts, which he had begun to lay out and dry in the Air, in order to find his own Account in it; and has discovered several Persons whom he assisted in loading a Hoy from the said Ship, from whom he had the single Bale, it’s supposed, for his Pains. Watermen usually carried passengers on the Thames: goods were the business of lightermen. However, this particular Deptford waterman had obviously decided to supplement his income with some very illicit carriage of goods. 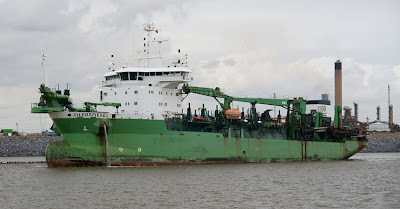 He had helped the 'several Persons' to load up their hoy, or cargo barge. There was something unusually serious about this particular theft. The two ships, the Bristol Merchant and Turkey Merchant, had come to London from Cyprus and Turkey infected with plague. As it was feared that the goods on board would spread the infection, both ships and cargoes were ordered to be burned; their owners received government compensation of a massive £23,935. Our waterman, then, was carrying good which were not only stolen but also a potential source of disease and death. If you travel regularly down the New Cross Road, you'll probably have noticed a large shopfront - at number 135 - which hosts ever-changing art displays. It's run by artists Tim Jones and Meena Chodha, who give artists a week each to use the window. It has certainly brightened up many of my bus journeys! In the central castle, in the Empyrean, the Emperor sits enthroned. In the lower heavens live the angelic knighthood. We, on Earth, are “outside the city wall”. How, we ask, can the Empyrean be the centre when it is not only on, but outside, the circumference of the whole universe? Because, as Dante was to say more clearly than anyone else, the spatial order is the opposite of the spiritual, and the material cosmos mirrors, hence reverses the reality, so that what is truly the rim seems to us the hub. The exquisite touch which denies our species even the tragic dignity of being outcasts by making us merely suburban, was added by Alanus. In other respects he reproduces Chalcidius’ outlook . We watch “the spectacle of the celestial dance” from its outskirts. Our highest privilege is to imitate it in such measure as we can. The Medieval Model is, if we may use the word, anthropoperipheral. We are creatures of the Margin. 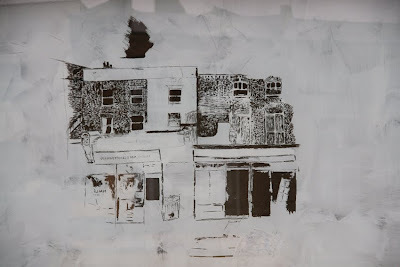 You can also follow progress on Mich's blog: a fascinating record of the work which also allows it to be shared by those spared the commute along New Cross Road! One of the good things about walking to work from Shoreditch High Street is the amount of street art in the area. 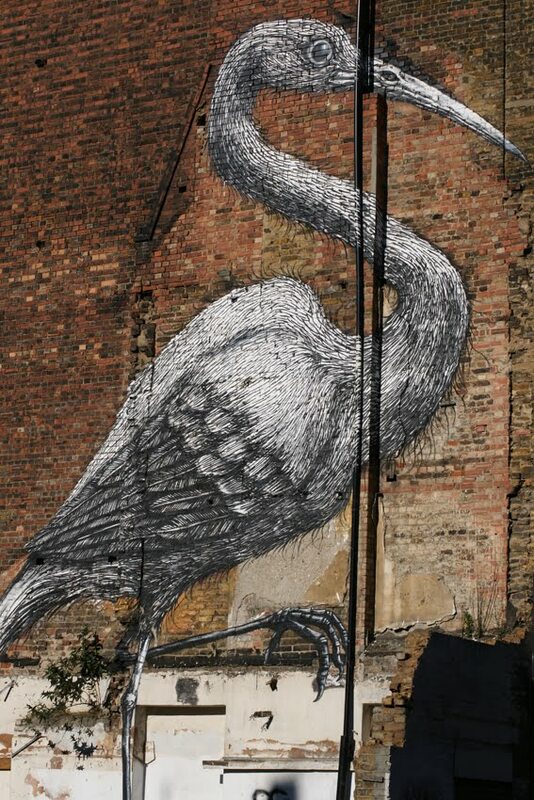 Among the most eye-catching examples are ROA's giant animals, including this rather appealing bird perched just off Brick Lane. 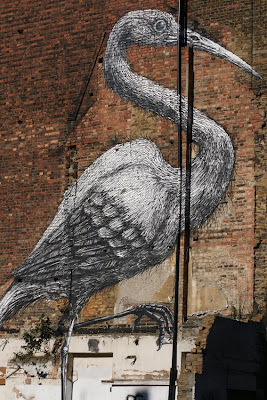 There's an account of its creation at Spitalfields Life: it involved a cherrypicker, conversion from a heron to a crane, and plenty of spray cans! For most Londoners, it's a good thing to see our streets populated by such wildlife. However, they're apparently less enthusiastic about it over at Hackney Council: Londonist reports that they have ordered the removal of ROA's giant rabbit from the Hackney Road. The building's owners approved it and love it, but that isn't cutting much ice. Apparently it's just 'graffiti ... clearly visible from the road.' Given the complete lack of resemblance to, er, graffiti, and the lack of threat posed by this particular bunny to local lettuces, the decision seems rather harsh. Supporters have hopped into action with a petition. 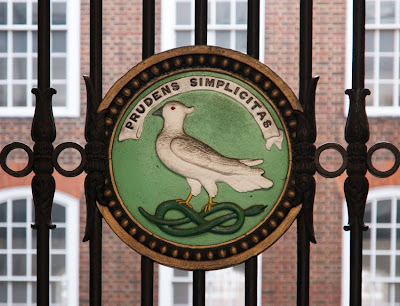 On a gateway in Fleet Street, a dove stands under the motto prudens simplicitas and on top of a knot. Look closer, and it's not string but a twisted serpent forming this unusual perch. Further down the gate is the legend 'Serjeant's Inn'. However, that is in a sense misleading, for the symbols belong to a quite different organisation. The Inn dates from the 15th century and was home to serjeants-at-law, an order of barristers. By the eighteenth century, its members would join with another inn on Chancery Lane; part of the site at 50 Fleet Street was occupied by the Amicable Society from 1838. This, the world's first mutual life insurance company, later merged with Norwich Union. The dove and serpent topped the Amicable Society's coat of arms; prudens simplicitas (prudent simplicity) was their motto. The unusual choice of creatures may refer to a biblical quotation in which Jesus exhorted followers to be 'wise as serpents, gentle as doves'. Lost during builidng works, the gates were rediscovered in a scrapyard in 1937 and returned to their original position here in 1970. Now the autumn weather has settled in, here's a nice seasonal pudding in a novel form! And then serve it up, without sugar or butter. 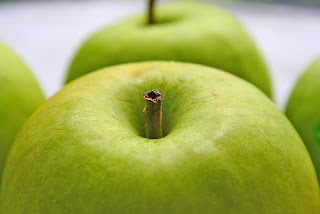 Modern Eve's pudding recipes not only fail to rhyme; they also make a rather less frugal dessert in which apples are topped with a sponge mixture. 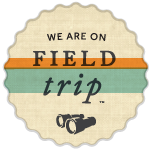 Image by monkeyc.net, shared under a Creative Commons license. A hundred years ago today, Mary Macarthur announced to the women chainmakers of Cradley Heath that their employers would pay them a minimum wage of 11 shillings a week. It was a huge victory for the women, and an important moment in British industrial history. 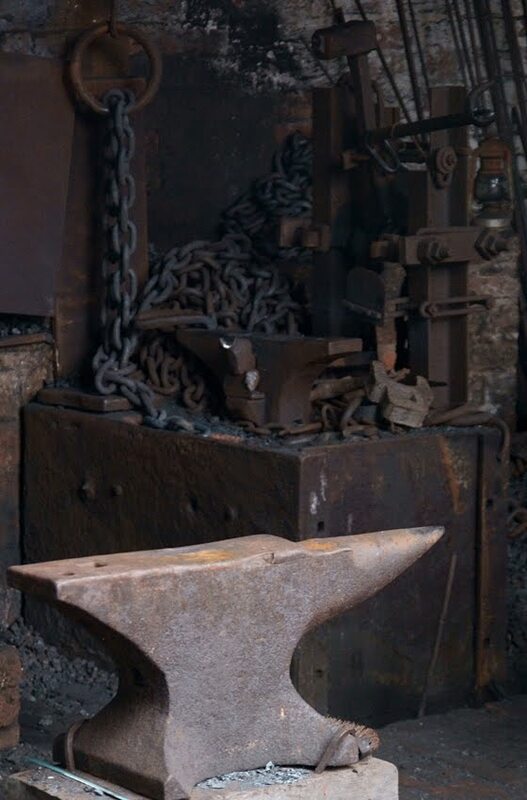 The chainmakers of the Black Country worked incredibly hard for over fifty hours a week making chain by hand. Women did this physically demanding labour among the unhealthy smoke and burning sparks of the forge, enduring extremes of temperature, and often minding their children at the same time. In return they got a pitiful wage of five shillings. It was barely enough to live on, hunger was the norm, and in 1898 writer Robert Harborough Sherard described them as the 'White Slaves of England'. Their employers were confident that they could get away with this because the workers were unorganised and for the most part, worked in small backyard workshops at home or with just a few other women. When the Trades Board Act set a minimum wage for chainmakers of 11 shillings a week, the employers took no notice. However, they had not foreseen the impact of labour organiser Mary Macarthur, the determination of the women, or the popular support their cause would attract. Macarthur was the thirty-year-old daughter of a Conservative grocer. Sent by him to observe a union meeting, she had been converted to the cause. 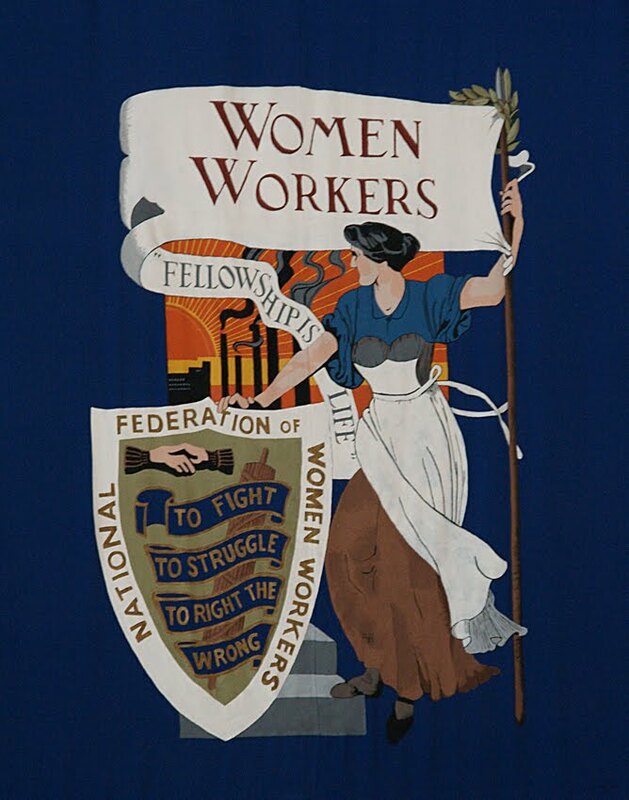 S he moved to London in 1903, and in 1906 founded the National Federation of Women Workers. She was also secretary of the Women's Trade Union League, which would become the women's section of the TUC. Crucially, Macarthur put effort into fundraising so that the women could receive strike pay of five shillings a week during the dispute. (Among the contributors to the fund were Okell & Owen, a Liverpool firm which exported the chains, George Cadbury who owned the chocolate company, Countess Beauchamp and the Countess of Warwick.) As a result, they were able to maintain the strike action for thirteen weeks until their victory of 22 October 1910. Indeed, there was enough money left over from the strike fund to build the Cradley Heath Workers' Institute. 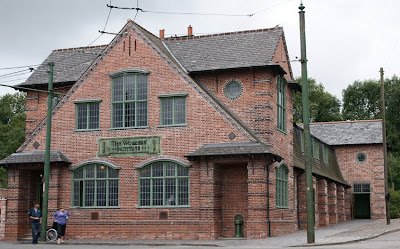 The building, a community centre and trade union headquarters, was moved to the Black Country Living Museum in 2008. On the Royal Mail website is a whole page of prohibited items ranging from the obvious (explosives and radioactive material) to the more surprising (batteries and water-based paint or ink). The Victorian post office seems to have taken a more liberal approach when faced with the unusual missives mailed by W Reginald Bray. A browse through The Englishman Who Posted Himself reveals a range of items (many illustrated) which must have tested the postmen's patience to the limit. Bray's most famous exploit was to post himself -now prohibited as the only living creatures the Royal Mail will carry are certain insects. 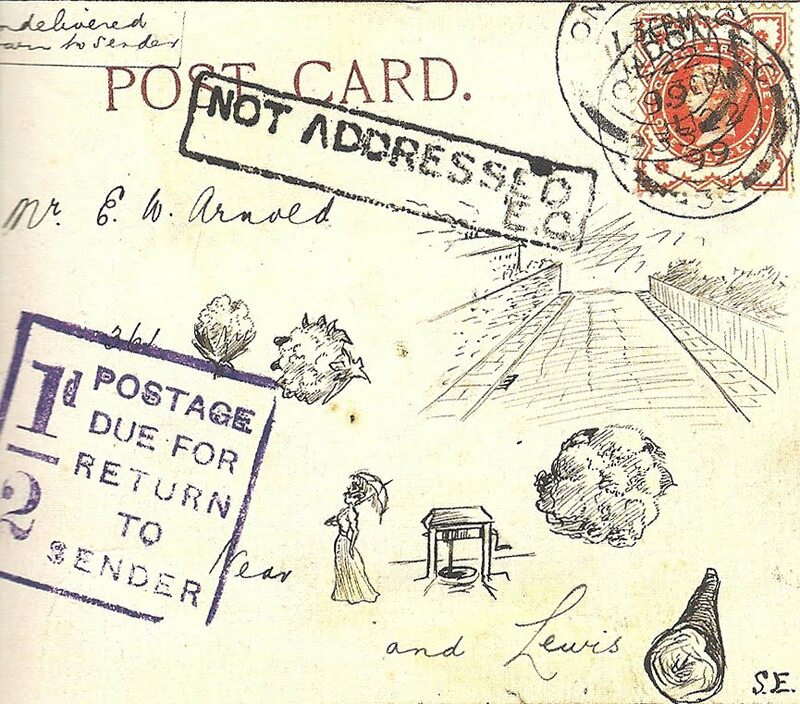 In 1900 and again in 1903, he sent himself by registered mail, being delivered to his home address by messenger. He also sent a range of other items, including a rabbit's skull with the address written along the nasal bone, a turnip, a frying pan and a cigarette (all unwrapped). Where envelopes were used, they could be equally unusual: one was crocheted, address and all, another made from a starched shirt collar. As if that wasn't enough, Bray found another way to tease and test the delivery service: unusual addresses. The one contained in a poem was relatively straightforward; mirror writing must have tested the postman's ingenuity a little further. Not all such experiments succeeded. It's perhaps unsurprising that a postcard addressed to 'any resident of London' was returned marked 'insufficiently addressed'. The picture puzzle below, for a south-east London address,* also didn't make it. However, Bray certainly got more value than most Victorians from the penny post. While the rules appear stricter today, perhaps there is still scope for experimentation. Any suggestions for an unusual item I could send, which would fit through a letterbox and not fall blatantly within the list of prohibited items? Further reading: John Tingey, The Englishman Who Posted Himself, Princeton Architectural Press, 2010. * 361 Brockley (broccoli) Road, Near Ladywell Wood and Lewis-ham, SE. Taunton Station hasn't been exempt from the strange rebranding of railway cafes, hence its 'Pumpkin' cafe sign. (The name is a mystery to me, since pumpkins are neither served within nor closely associated with trains.) However, above is a dignified 1930s mosaic which simply proclaims 'Refreshments'. Greenwich Park will be in the news in 2012 as the venue for equestrian events in the London Olympics. Over a century ago, it was getting a rather different kind of press attention, for a tragic event which remains mysterious to this day. On 15 February 1894, Martial Bourdin's walk through Greenwich Park ended in disaster when he tripped over. As he fell, he dropped a bomb which went off and blew away his left hand and stomach. He was taken on a stretcher to the Seamen's Hospital, but died there half an hour later. Police soon discovered his name and that he was a 26-year-old Frenchman staying in Fitzroy Street; he had taken the tram to Greenwich that morning, carrying a large amount of money in addition to the bomb. Although still able to speak immediately after the explosion, Bourdin didn't say anything about what he had been planning to do. It was assumed that he had intended to blow up the Royal Observatory, but nothing is known for certain. Revolutionary bombings had been a problem throughout Europe in the late nineteenth century: most famously, Tsar Alexander II of Russia was assassinated by bomb in 1881. There had been several anarchist bombings in France in the months before Bourdin's accident; later that year, the president would be assassinated. Bourdin was connected to other foreign anarchists through his membership of Club Autonomie, which police raided shortly after his death - but no one was charged. Nonetheless, initial press reports spoke of an international conspiracy with Bourdin as head of a gang. Graphic accounts were given of his injuries and it was wrongly claimed that his hands were covered in an (impliedly demonic) black substance which would not come off. The Times hinted that his funeral was being planned from Paris or Ireland; the MP for Deptford, Charles Darling, was sufficiently concerned about it becoming the focus of an anarchist demonstration that he raised the matter in parliament. His suggestion was that as Bourdin had brought about his own death, his body should be quietly disposed of as a suicide's. The Home Secretary declined to order such a step or to keep the body unburied until the coroner's verdict. In the event, although Bourdin's funeral did attract fellow anarchists, they were outnumbered by the police and a hostile crowd. We still don't know exactly what Bourdin meant to achieve. His bomb was too small to cause major damage, and the Royal Observatory seems a rather unlikely target. The New York Times pointed out that since Britain was something of a refuge for anarchists, it would be against their interests to commit an outrage here; indeed, Britain's anarchists either ignored the incident or denied involvement in it. Maybe he didn't mean to blow the observatory up at all: it has been suggested that he was attempting to dispose of the bomb before leaving the country or had been duped into carrying it (perhaps by his police-informer brother-in-law). Such an outrage might have served the interests of those trying to pass anti-immigration legislation, or of foreign governments hoping to provoke a British clampdown on anarchist activity. On the other hand, the observatory did represent science and the worldwide regulation of time, while the police assumed that the money indicated an intention to flee the country. Where in London would you find this bird stood on a more than usually serpentine knot? What could possibly garnish such a feast of punctuation better than a pointing hand? The public baths and free library, alas, are gone. 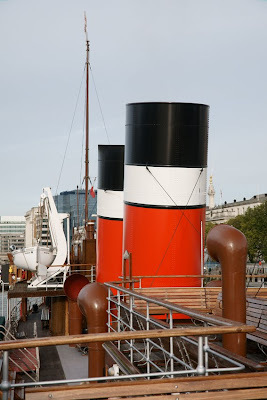 We make a slightly belated end to our week on the Thames with a visit to the Waverley's engine room. 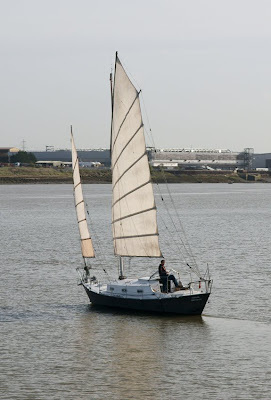 Thames week continues with the story of an institution not normally connected with the river. The School of Hygience and Tropical Medicine, however, has its origins right here on the river in Deptford. 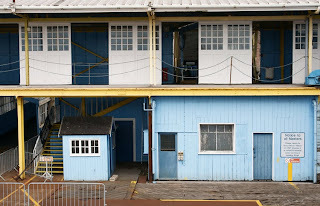 What connection does Deptford Dockyard have to the University of London? The answer is that a hospital ship moored there nearly 200 years ago was the seed of the London School of Hygiene and Tropical Medicine, today a college of the University. The Seamen’s Hospital Society was established to care for sailors in the merchant navy and fishing fleets, ie those outside the Royal Navy and its institutions. In October 1821, seven months after the society’s first meeting, a hospital ship came into service at Deptford: HMS Grampus, a former naval vessel. 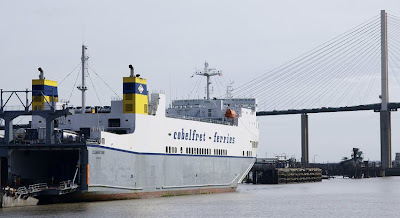 It had been commissioned in 1803 and was employed in the East Indies, the Cape of Good Hope, and as a troopship before its latter career as a floating hospital. The ship’s surgeon, Dr David Arnott, was paid £150 per year. The hospital treated sailors of all nations; during cholera outbreaks it would moor a smaller boat alongside to act as an isolation unit. The ship’s capacity was soon stretched as it treated over 2,000 people a year. 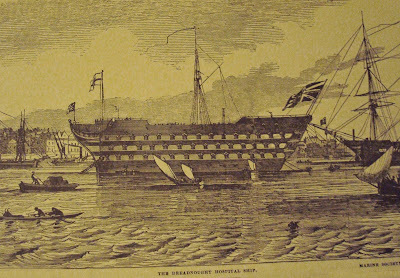 Ten years later, the Society’s hospital moved onto the larger HMS Dreadnought (and then a second ship, also renamed Dreadnought). When it came onshore and took over the former Royal Naval Hospital at Greenwich in 1870, it renamed it the Dreadnought Seamen’s Hospital and began to employ female nurses for the first time. This hospital would continue providing care to seamen at Greenwich until 1986; today the former premises are part of the University of Greenwich. Such medical services were important for two reasons. First, in the days before the NHS, people often relied upon charitable institutions to provide medical care. The Seamen’s Hospital Society was one such charity. Second, sailors often had specialist medical needs which the hospital met in two notable ways. One was its campaign for lime juice to be provided to sailors to prevent scurvy; the other was the realisation that as sailors’ work took them around the world, they might contract diseases unfamiliar to most British doctors. The ability to treat such illnesses was central to the development of the Society’s facilities. In 1890, the Society opened a new branch of the hospital: the Albert Dock Seamen’s Hospital. Here, the London School of Tropical Medicine was established in 1899 by Sir Patrick Manson, who had worked in the Far East and believed strongly in the importance of training doctors to properly treat people dying of tropical diseases. The School moved to central London in 1920. At the same time, the Society created a Hospital for Tropical Diseases near Euston Square; it still exists today, as part of the University College Hospitals NHS Trust. 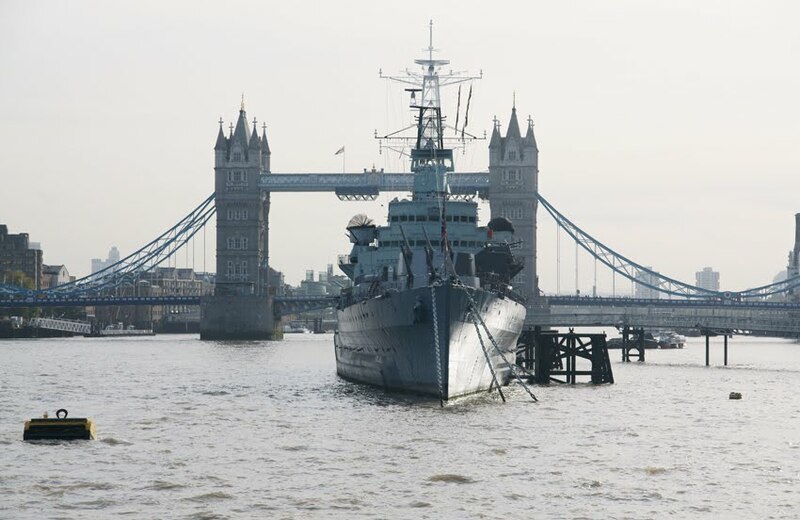 The Society itself also continues to look after the welfare of sailors through grants, a benefits advice line, and the Dreadnought Unit at St Thomas’ Hospital. When we think of defences against the Blitz, we probably think first of barrage balloons, searchlights sweeping London's sky, and anti-aircraft guns. 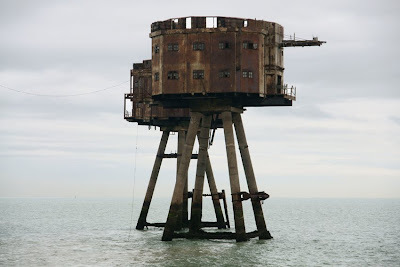 Quietly rusting in the Thames is another piece of those defences: the Maunsell forts at Shivering Sands and Red Sands. The Maunsell Forts were groups of platforms constructed on land, then towed out to sea and sunk in place. These two forts, and a third (now dismantled) at Nore, were made up of seven interconnected platforms. (The connecting steel walkways have almost all gone now.) One was a control centre with accommodation, another a searchlight tower, and the other five held guns. They aimed to bring down bombers using the Thames for navigation, and succeeded in shooting down 22 aircraft and 30 flying bombs. Decommissioning in the 1950s didn't end the careers of these forts. 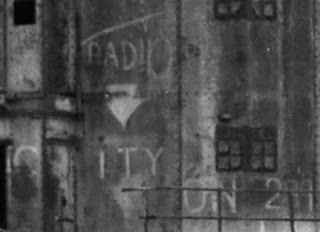 They were used in the 1960s by pirate radio stations; traces of Radio City are still visible at Shivering Sands. The station was originally Radio Sutch (as in the Screaming Lord) before being taken over by Reginald Calvert; in 1966 he was shot by a director of Radio Caroline in a killing ruled to be self-defence. A more official use of radio was the relaying of wind and tide information from monitoring equipment in the fort's searchlight tower. It had been isolated from the other five surviving towers when a sixth was sunk in a ship collision in 1963. 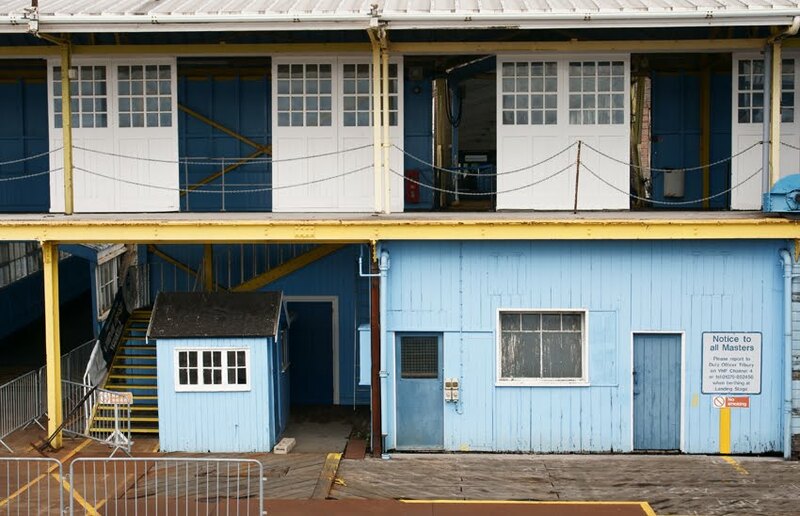 That isolation attracted artist Stephen Turner for his Seafort Project, living in the tower for 36 days in 2005. As well as military and radio history, the forts have their place in industrial history. They played a role in the development of other offshore activities such as offshore oil platforms, the first of which was constructed in the late 1940s. Such resonances, as well as their eerie but imposing presence, all offer good reasons for their preservation: a task now being undertaken by Project Redsand. 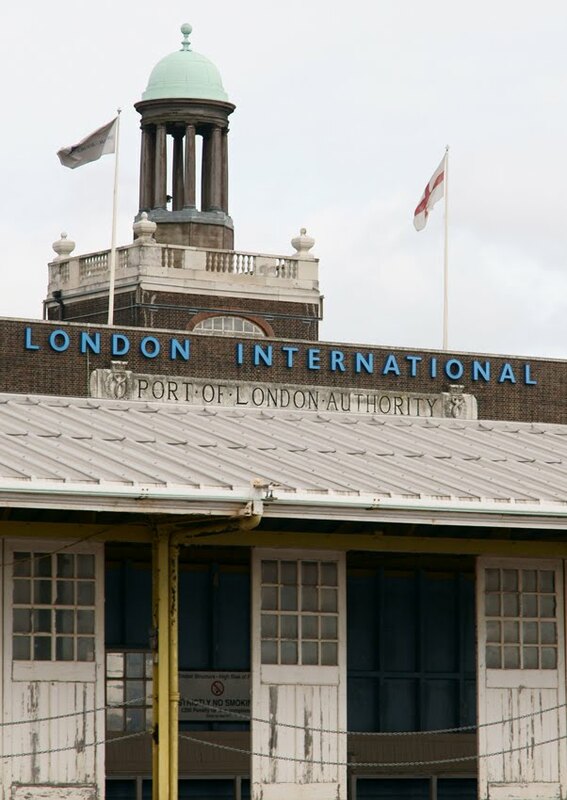 Showing a Ryanair-style flair for naming, the London Cruise Terminal is in fact not in London but in Tilbury. However, it has a far more venerable history than any budget airline, having been opened by Ramsay Macdonald in 1930. Liner berths had been available at Tilbury since 1909, when they were opened especially for P&O. The new passenger landing stage was part of an expansion which also saw a railway station open alongside. Many of the passengers using these facilities were making truly momentous journeys, passing through as emigrants or immigrants. The Empire Windrush arrived here from the Caribbean in 1948; countless 'Ten Pound Poms' departed for a new life in Australia. As immigration and international travel came to depend more upon aeroplanes than upon ocean liners, however, the terminal declined and closed in the 1970s. The story has a happy ending, though: the Cruise Terminal is now open once more, this time to serve cruise ships. (The neighbouring railway station remains closed; the primary transport link is now the M25 motorway.) Tourists leaving for the Baltics, the Netherlands and even the Amazon, or arriving to enjoy London and South-East England have brought new life - although the Grade II listed structure retains its vintage style and an air of shabby gentility. 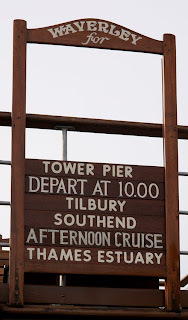 At the weekend, I took a daytrip on the Paddle Steamer Waverley from Tower Bridge to Southend on Sea. 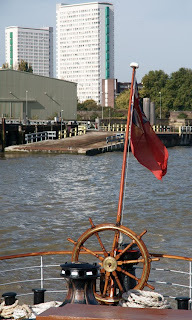 There was so much of interest that this week is devoted to a Thames theme - starting, of course, with the boat itself. PS Waverley is the last sea-going paddle steamer in the world. It travels around the British coast for much of the year, with some of its time spent on the Thames. Such excursions are part of Britain's leisure history: since the nineteenth century, steamer trips have been a popular recreation. They are certainly a significant, if not always happy, part of London's past. The trip to Southend was particularly popular, and it was very nice to pay tribute to that by arriving at the traditional point: the end of the pier, 1.3 miles from dry land! A n earlier PS Waverley had been sunk off Dunkirk in 1940; its namesake was built on the Clyde in 1946-7 and for many years worked in West Scotland. However, by 1974 running costs were too high - despite conversion from coal to oil in 1957 - and it was withdrawn from service. 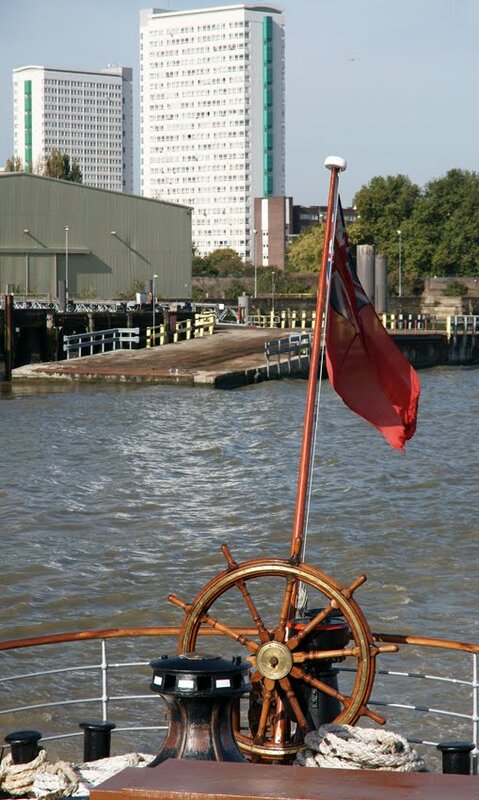 The Paddle Steamer Preservation Society bought it for just £1, and after restoration it began its new, nationwide career. 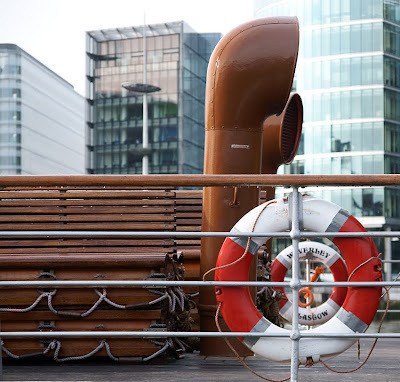 The Waverley can not only take up to 800 passengers, but keep them refreshed in its restaurant and bars. Just as well, then, that it has a 2,100 horse power engine. 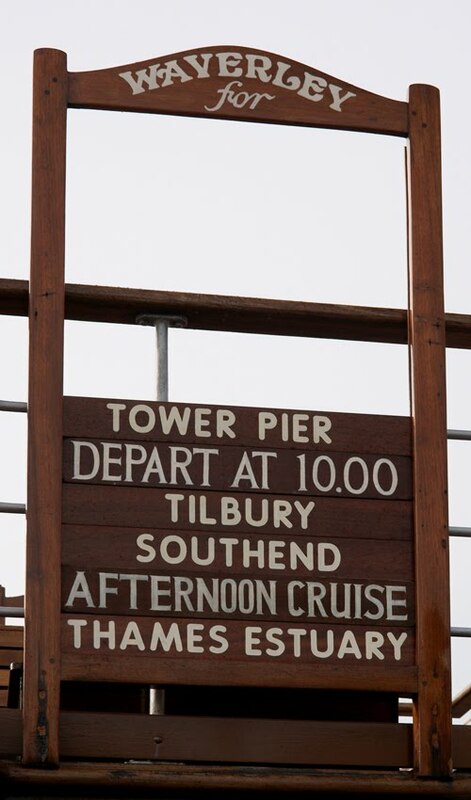 The journey from central London to the end of Southend's pier took 3.5 hours; Londoners more used to the Thames Clippers will be surprised at the smoothness of the ride! The town of Bridgwater in Somerset is still known for its annual Carnival, and many people who travelled to the south-west before the M5 was built remember the smell of its Cellophane factory, but it has a far more curious claim to fame. Now almost forgotten is the invention there of a bizarre early computer called Eureka. John Clark grew up in the surrounding area, and became a printer in the town. However, in 1830 he had his brainwave. Forget the calculating machines which make far more obvious descendants for today's computers: this was a machine for composing Latin hexameter verse. The machine was duly built (it took 13 years), and Clark exhibited it at the Egyptian Hall in Piccadilly in 1845. Eureka worked by having a series of cylinders, each accounting for one word and each cylinder dealing with one part of speech (subject noun, adjective, verb, etc). Each cylinder operated a series of staves with the alphabet, so that its movement caused the staves to form new words. The cylinders would rotate randomly so that a different line of verse appeared each time the machine stopped. It would then pause to allow spectators to read and write down the line before starting again. The whole process took about a minute per line, but spectators were kept entertained as Eureka also played the national anthem. To warn visitors when a line was about to be broken up, it burst into a tune called 'Fly not yet'. The whole effect was clearly exciting enough to the early Victorians that huge numbers were prepared to pay a shilling to view it: the exhibition was a great success and Clark would retire after it. Since he was a member of the same family that founded Clark's shoes, the machine made its way to the Shoe Museum in Street. It is still there today, but not currently on public display. (Clark's display of financial acumen here was not typical: he also patented a method of waterproofing cloth, but to his financial loss, sold it to one Mackintosh). Did it produce great poetry? Probably not: one line was 'BARBARA FROENA DOMI PROMITTUNT FOEDERA MALA' ('Barbarian bridles at home promise evil covenants'). However, it probably had the same appeal as various jargon generators do today - fancy creating a 'random Latin hexameter' website? Tomorrow I'm spending the day on Paddle Steamer Waverley, so one story in today's news seemed particularly well-timed. The wreck of a less fortunate paddle steamer, sunk in 1941, has been discovered by divers. HMS Snaefell was built in 1907 for pleasure trips around South Wales. Owned by the Barry Railway Company, its original name was PS Barry. It served in the First World War carrying both prisoners and troops, before returning to civilian life as HMS Waverley. When the Second World War broke out, it returned to duty under its final name. A Dunkirk 'little ship', it safely evacuated over 1,000 people. A year later, though, it was sunk by a direct hit near Whitley Bay. Shell cases around the site indicate that it had done its best to fight back. The wreck has now been rediscovered by the Silent Running Dive Team and skipper Allan Lopez - not north of the Tyne, where it was believed to be, but off the coast of County Durham. It is a war grave - three men died when it sank - so will be left intact on the sea bed. Further reading: The Guardian; ChronicleLive.